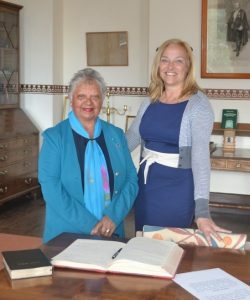 Mrs Patsy Flagg MBE JP has been appointed this afternoon by Governor Lisa Phillips as Acting Sheriff of St Helena from Sunday 31 July to Wednesday 14 September 2016 (see attached photo), while the substantive Sheriff, Mrs Ethel Yon OBE, is temporarily off Island. The Sheriff’s prescribed Oaths were taken before Her Excellency in the Governor’s Office at the Castle. The Sheriff of St Helena is nominally responsible for enforcing Court Orders, usually carried out by the Police Service on the Sheriff’s behalf. The Sheriff is also responsible for summoning Jurors when a Jury is required, either in the Supreme Court or for a Coroner’s Inquest. The most conspicuous public role, however, is the swearing in of Governors and Acting Governors.